Old hardwood floors are enchanting. They're made with tough old growth wood, featuring a tight, even grain that modern wood just can't match, and you can tell they were installed with craft and dedication by flooring experts who knew precisely what they were doing. While they're easy to admire, they can be tricky to restore and repair for the very reasons that make them so desirable: they're not at all forgiving of mistakes, and their timeless beauty clashes jarringly with modern materials. So, how do you repair, patch, or restore a historic floor that needs some love to look its best? Some people leave it to the experts and call in people who focus on historic remodeling and preservation, as these construction pros have the experience needed to work with old materials safely and effectively. Others, however, want to do the work themselves, or at least make a start on their own. If you're a DIYer when it comes to floor restoration and repair, be aware that mistakes can be costly, so take your time to research and do it right. Fine Homebuilding has a great series on patching hardwood floors that explains some of the challenges involved as well as the steps needed to make a patch work invisibly within the existing floor. If you're taking out old heat registers or hopelessly damaged sections of floor, you'll need to be able to assess the condition of the underlying joints and subfloor, install bracing material under the patch, and lay down a subfloor patch over it in order to support your new hardwood floor. In addition, you'll need to cut into the existing floor to carefully remove lengths so your patch will seamlessly blend rather than standing out. It's fiddly, delicate work, and we haven't even gotten to the tricky part: sourcing your flooring material. You never want to use new hardwood flooring, even when it comes from great sources, to patch a historic floor, because it won't match. The grain of the wood will be different, and the color isn't likely to be a match either. Instead, you've got to hit up salvage yards and homes being torn down to see if you can find lengths of historic hardwood flooring you can reuse in your repaired floor. Keep an eye out for lengths that hadn't been sanded and refinished too many times, as you only get a few sandings out of a floor over the course of its life. You're also going to need to refinish the floor if you want to do it right. If you're patching a floor, chances are high the whole thing needs refinishing anyway to address wear and tear. That means you're going to need to sand it down, smooth it out, and apply a new layer of finishing material to seal it and keep it in good shape. Once you're finished, the patch should be indistinguishable from the rest of the floor, and the whole thing should be glowing like new once again -- so be sure to add floor protectectors to the legs of your furniture and make sure the floor is protected from gouges, water, insects, and other problems! 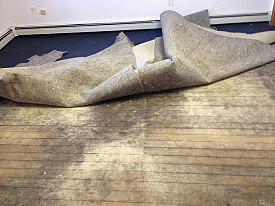 Sometimes, restoration just isn't possible because the bulk of the floor is just too badly damaged. Sites like Home Flooring Pros can help you track down information about flooring types and styles to give you a range of options before you decide on what you want to do with an older floor. Many modern flooring options can work very well in a historic home renovation, if installed well and chosen with care.